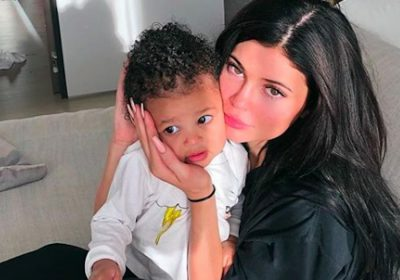 It looks like 5-year-old North West isn’t the only one who’s following in her mom’s beauty mogul footsteps. 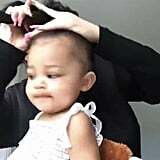 Kylie Jenner’s daughter Stormi Webster is already becoming a mini influencer and starring in her mom’s hair-themed Instagram stories. 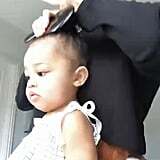 The 1-year-old got her hair done by the owner of Kylie Cosmetics herself – and looked mighty cute doing it. 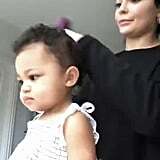 Jenner gave Webster a small ponytail, and wrote in the caption that she loves doing her hair, and although she’s not the best at it, she’s learning. 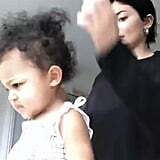 She also mentioned that some of her favorite memories were of her mom doing her own hair. 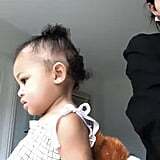 While Webster’s hair isn’t long enough to all fit in a ponytail yet, we’re sure that as soon as she’s old enough she’ll be wearing it at super-long lengths just like her aunties.